I'm not joking when I say I have decorating on my mind ALL THE TIME lately! 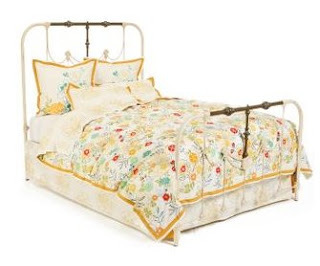 Specifically, I have been dreaming of how my soon-to-be guestroom will look. I don't really know why, but I have always wanted a beautiful guestroom:) I love staying at someone's home and feeling like there is a special place just for me. That's how I want friends and family to feel when they visit us! 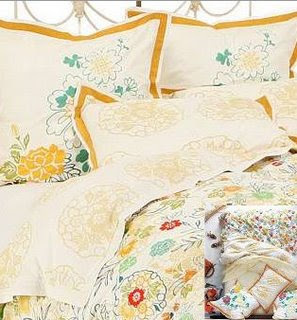 So, after many hours of looking for bedding that could possibly make the cut, I have found the Morning Glory collection from Anthropologie. It is a bit pricey, so I at least have the idea for the room, but I will have to see what kind of budget my darling husband will compromise on:) I want the room to feel fun and bright, but welcoming at the same time. I love the Morning Glory! Looks SO cute and bright. It would help your guests wake up with a jump in their step. Why does Anthropologie have to be so wonderful and SO expensive!? I like it! I also like the guestroom. We will see. It might depend on how quick you want the guestroom done. Might have to save up for it. The cost won't be a waste because it will be interchangable with our bedding.